Bankcheckingsavings has partnered with CardRatings for our coverage of credit card products. Bankcheckingsavings and CardRatings may receive a commission from card issuers. The American Express Delta Reserve for Business Credit Card is a solid business credit card for loyal Delta business travelers who like to travel in style. It’s best for those who that have large expenses or want to earn status with Delta. New applicants can earn 40,000 bonus miles and 10,000 Medallion Qualification Miles (MQMs) when you spend $3,000 in three months. The bonus miles is equivalent to $500. I advise you to use this bonus to offset the annual fee of $450 that isn’t waived the first year (See Rates & Fees). Cardholders earn 2 miles per $1 spent on eligible purchases made directly with Delta. Then, all other purchases earn 1 mile per $1 spent. Receive complimentary and unlimited access to Delta Sky Club airport lounges for the primary cardholder. In addition, it boosts cardholders toward exalted Delta Medallion status, with even better rewards for huge spenders. Plus, get a complimentary companion airfare ticket (taxes and fees not included) on every cardmember anniversary. • Earn 40,000 bonus miles and 10,000 Medallion® Qualification Miles (MQMs) after you spend $3,000 in purchases with your new Card in your first 3 months. • Earn 15,000 Medallion® Qualification Miles (MQMs) and 15,000 bonus miles after you reach $30,000 in eligible purchases on your Card in the calendar year. • Enter Delta Sky Club® at no cost and bring up to two guests for an exclusive rate of $29 per person per visit. The Delta Reserve for Business earns an unlimited 2 Delta SkyMiles for every $1 spent on eligible Delta purchases. All other eligible purchases earn an unlimited 1 SkyMile per $1 spent. There are no caps or restrictions on how much you can earn or spend. 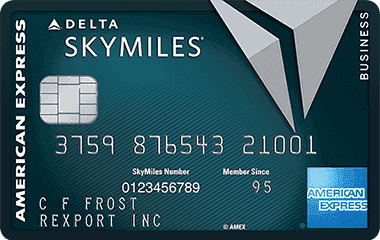 Redeem your SkyMiles for airfare, gift cards, merchandise, and experiences at the Delta SkyMiles MarketPlace. Non-airfare redemptions usually offer the lowest value out of your miles, as they’re generally worth less than $0.01 apiece. However, redemptions begin with as little as 2,000 SkyMiles in the MarketPlace. The best way to redeem your SkyMiles is for Delta airfare. Domestic economy one-ways within the U.S. typically require at least 10,000 SkyMiles. However, Delta’s redemption tables are subject to change over time. Longer flights within certain regions and high-demand flights require more SkyMiles. Generally, miles are worth anywhere from $0.005 to $0.02 at redemption. However, SkyMile values fluctuate depending on the route, time of week, time of day, and other factors. The most generous benefits of the Delta Reserve for Business come from the Delta Medallion status program. This boasts a variety of perks designed to increase comfort and convenience for frequent Delta flyers. These include accelerated MQM and SkyMiles earnings, complimentary preferred seating and class upgrades, priority boarding, waived baggage fees, and more. There are four tiers to this program: Silver, Gold, Platinum, and Diamond. As you go up, the benefits get better. For example, the highest tier, Diamond status, includes two Global Entry application vouchers, complimentary Sky Club membership, Medallion status gifting privileges, and more. To reach each status level, you need a combination of Medallion Qualification Miles (actual flight miles calculated as a multiple of total flight distance) or Medallion Qualification Segments (any Delta flight segment) and Medallion Qualification Dollars (base fares, surcharges, and certain upgrades, not including taxes or fees) within a calendar year. The American Express Delta Reserve for Business Credit Card is aimed at traveling business owners valuing lounge access and elite status. If you’re into Delta’s elite status program, Delta is one of the only airlines that lets you earn elite status simply from spending on your credit card. Those who aren’t avidly reaching for this status should not get this card. The American Express Platinum card features the same lounge access rules as this card but comes with a better earning structure and lets you flexibly use your rewards on other airlines. In addition, while many U.S. air travelers have considered flying Delta at some point, only a small amount have walked into a Sky Club lounge or gotten the huge perks available only to Diamond Medallion status members. Keep in mind the annual fee on this card is $450. Thus, it’s only worth it if you fly often with Delta or just travel a lot in general. Check out our complete list of Credit Card Promotions if you’re looking for more options. Alex is not one to pass up a good deal on anything, from flight deals to free food, she'll give you all the details you need to save and make you some extra money. Not only that, she makes sure you can pocket the extra cash to take advantage of other sales and promotions on BCS. Offline, Alex enjoys eating, PC gaming, and drawing in her free time!